Capturing those special moments our in house photographer Wayne captures this moments in these very stunning a detailed images our wedding packages includes. that so many people miss. Infinity Giant letters are the latest must have item for your special occasion. Our bespoke handcrafted letters stand 4 feet high, finished in high gloss white and are illuminated with a choice of warm white light to give them a soft vintage look or a colour to fit in with your theme. top table, on the dance floor for some fun action photos. are a professional rock n roll covers band, offering high quality musical services across the Midlands region. We specialize in rock n roll music from the 50's & 60's and all songs are carefully chosen with an upbeat tempo in mind, to ensure the dance floor is always full. This unique approach has seen The Shakes become the leading rock n roll covers band in the area. 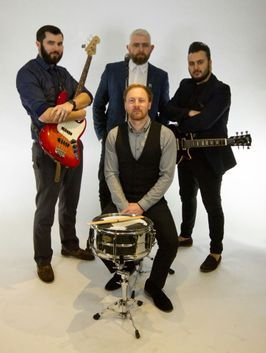 "All songs are carefully chosen with an upbeat tempo in mind, to ensure the dance floor is always full"
We are capable of offering bespoke packages for private parties, weddings, festivals, charity & corporate events. We normally provide either 1 x 60 min set, 2 x 45 min sets, or, 3 x 30 min sets. But where applicable, we can also offer additional music through an I Pod/PA system to keep the party going before, between and after our sets. ​We supply all musical and lighting equipment required to ensure your event runs smoothly and all performances are backed up with full liability insurance. ​If you are looking for an authentic live rock n roll experience for your event, then you have come to the right place. Please contact us for more information. Uplighting is the perfect way to set the mood for your event. Up-lighters provide gentle, diffused, fill in light around the room on a large scale. The help to eliminate deep shadows and harsh down lighting and create an inviting atmosphere for you and your guests. Our up-lighters have many light settings from soft white and delicate pastels to bright bold colors and can give a whole room a glow in a way no normal lighting does. Our lights are discreet and only need to be placed at the edges of the room to create the full effect. If you're looking to give your event a WOW Factor then our LED dance floor can do just that. It's the most sophisticated dancefloor available! As you and your guests are dancing the night away the dance floor lights up with thousands of different colour schemes, in a myriad of spectacular patterns. so can be used in marquees as well as traditional venues. Let the mirror guide you through your photo shoot whist giving you kind compliments and leads you through the fun and the option to sign the mirror or leave messages before your photo is printed for you to share with your friends and family. You can also connect onto social media to share your images online. The Magic Selfie Mirror can be customised to your event, creating a unique and bespoke element to your party or function simply let us know your ideas and we can get to work on creating your unique celebration. We are also excited to offer the Magic Selfie Mirror for Corporate Events, Trade Shows, Private Events, Charity Events and Product Launches or indeed any other Special Occasion. Unlike a photo booth the Magic Mirror looks spectacular and unique and takes up less space at any function and can be set up ready to go in 10 minutes.